Law Day was organised at Universal Group of Institutions to make students aware about their fundamental rights and duties. The celebration was presided by Justice Balbir Singh, District and Sessions Judge, Chandigarh. 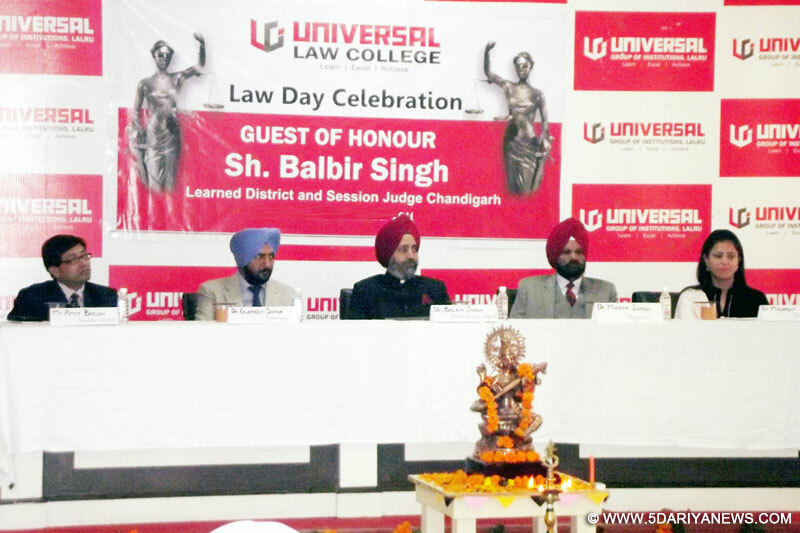 While delivering his address to the students Justice Balbir Singh highlight the importance of Law Day and congratulated students for choosing Law as a career. According to him Law Day is aimed to help people & appreciate their liberties especially with regard to equality and justice. It also aims to cultivate respect for the law, which is vital to the democratic way of life. The Judge Balbir Singh also inaugurated Legal Aid Clinic on this occasion.The students also hold legal awareness program and took initiative to uphold the cause of imparting legal education to the residents, especially focusing on the youths of today who will be the future of tomorrow. They informed residents about legal education on contemporary legal issues like cyber-crimes, human trafficking, anti-ragging and road safety. Later, students also gave power point presentations & depicted the issues and challenges in today’s world.Chairman, Universal Group, Dr. Gurpreet Singh said at the moment that the main objectives of celebrating Law Day is to recognize the important principles which formed the basis of the Constitution. These principles include the rule of law, independence of the Judiciary.